Great Haywood Services Wharf is a minor waterways place minor waterways place place on the waterways major waterways place village town city on the Trent and Mersey Canal (Main Line - Great Haywood to Etruria) between Etruria Junction (Junction with the Trent and Mersey Canal, Caldon Branch, Uttoxeter 30 miles) (18 miles and 7¾ furlongs and 18 locks to the northwest) and Great Haywood Junction (Junction of Trent and Mersey and Staffordshire and Worcestershire Canals) (¼ furlongs to the south). 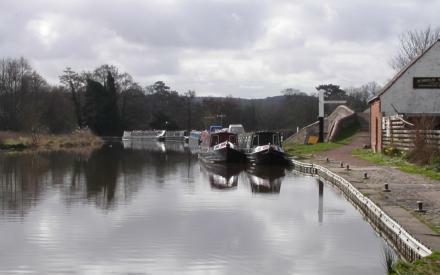 The nearest place in the direction of Etruria Junction is Mill Lane Bridge No 74 (Shardlow 38 miles / Preston Brook 54 miles); ¼ furlongs away. Elm Close, Great Haywood, Stafford, ST18 0SP — 290 yards to the southeast. Birmingham — 832 yards to the southeast. Sheffield, S8 7UE — 818 yards to the southeast. Mill Lane, Stafford, ST18 0RQ — 109 yards to the northeast. 2 Yelland Walk, Great Haywood, Stafford, ST18 0WJ — 1165 yards to the southeast. Stafford — 1120 yards to the southeast. 5 Rockhouse Drive Great Haywood, Stafford, 18 — 736 yards to the southeast. Stafford — 1233 yards to the west. Main Road, Great Haywood, Stafford, ST18 0SU — 571 yards to the southeast. Stafford — 61 yards to the south. Shugborough Estate, A513 Stafford to Lichfield road, Milford, Stafford, ST17 0XB — 691 yards to the southwest. Stafford, ST18 0 — 853 yards to the southeast. Mill Lane, Great Haywood, Stafford, ST18 0RQ — 113 yards to the northeast. Trent Lane, Great Haywood, Stafford, ST18 0ST — 384 yards to the south. 462 yards to the south. Main Rd, Little Haywood, Stafford, ST18 0TR — 1353 yards to the southeast. The Mill, Mill Lane Unit 3, Stafford, ST18 0RJ — 103 yards to the west. Lock Cottage, Hoo Mill Lane, Great Haywood, Stafford, 180 — 1124 yards to the north. Stafford — 493 yards to the east. Spar Store, Main Road, Great Haywood, Stafford, ST18 0SW — 419 yards to the southeast. Great Haywood, Stafford, ST18 0 — 685 yards to the northeast. Bedford Avenue, Stafford — 649 yards to the east. Stafford, ST18 0 — 474 yards to the south. 30 Rockhouse Drive, Stafford, ST18 0TD — 746 yards to the southeast. Stafford — 823 yards to the southeast. Stafford — 229 yards to the south. Great Haywood, Stafford, ST18 0TA — 685 yards to the northeast. Staffordshire, West Midlands., Stafford — 1190 yards to the southeast. Brewery Lane, Great Haywood, Stafford, ST18 0SN, Stafford, ST18 0SN — 449 yards to the southeast. Ingestre, Stafford, ST18 0ZF — 1459 yards to the north. Main Rd, Great Haywood, Stafford, STAFFORD. ST18 0SB — 478 yards to the southeast. Brewery Lane, Stafford, ST18 0SN — 449 yards to the southeast. Freedom Caravans Limited, Main Road, Little Haywood, Stafford, ST18 0TR — 1446 yards to the southeast. 475 yards to the southwest.